We had the good fortune to meet Manny Pacquiao as he entered the Mabuhay Lounge of Philippine Airlines last Friday as he was about to catch a flight for his hometown of General Santos City and we were leaving for Cebu around the same time. We covered what was overall an excellent fight card which was staged for the first time in the lovely municipality of Compostela by our friend, promoter Sammy Gello-ani and hosted by youthful Mayor Ritche Wagas. The simple folk of Compostela gave our Viva TV team a genuinely warm welcome which is so typical of the people in the Visayas and Mindanao who are decent and unspoiled. But this column is about Manny who celebrates his 30th birthday on December 17. We had the privilege of knowing Pacquiao since he was a 16 year old kid who quickly became a star on our weekly boxing show “Blow by Blow” which we produced and covered for Vintage Television along with longtime friends Rod Nazario, Lito Mondejar and Moy Lainez... men steeped in boxing. We saw Pacquiao grow right before our eyes in a sense, and originally marveled not at his skill but at his indomitable courage which was a reflection of his Filipino heart. We have seen so many fighters come and go but there has been no one quite like Manny. While our beloved friend, the late Gabriel “Flash” Elorde was a hero in his time and a decent human being of epic dimensions, as a fighter we must concede that Pacquiao is something else. Matchless. But to us the most satisfying aspect of Pacquiao is his growing appreciation of right from wrong and an acknowledgement of his humble beginnings which have all added up to a humility that is so rare in a young man who has scaled the heights and achieved so much not just for himself but for his country and people. The young man has changed, all for the better. His graciousness to his vanquished opponents, his sincerity in dealing with people and a recognition of what he did wrong and his drive to right the wrongs are examples worth following for the millions who look up to him as a hero. There is one striking dimension that has truly lifted our spirits just as it has filled the heart of our fine parish priest at St. Paul the Apostle in Barangay Laging Handa, Quezon City, Fr. Nong. And that is Manny’s gesture of praying in his dressing room before he walks towards the ring with the smile of a fighter at peace with himself and humanity. He goes down on his knee and prays in his corner before the introductions and right after victory, no matter whether it is hard-fought or handsome, immediately goes to his corner to thank God for His infinite mercy in protecting and rewarding him. His leaning over a battered and fallen David Diaz and trying to pick him up and his warm embrace of a vanquished De La Hoya were acts of rare respect and humility and with his numerous deeds of kindness to his less fortunate countrymen, Pacquiao has defined the qualities of a Filipino athlete we can all be singularly proud of. When we were privileged to be the ring announcer for Pacquiao’s fight against Fahsan 3K Battery at The Fort some years ago we introduced Pacquiao as “our national treasure.” We are glad that we did, because the world of boxing both at home and around the world have indeed accepted him as a national treasure whose worth can never truly be estimated. May Manny continue to find peace, happiness and success and fight the good fight for the joy he brings millions of Filipinos and fight fans around the world as he celebrates his 30th birthday and let us all whisper a prayer that he will remain the same decent, humble young man who has been embraced by a nation and people desperately searching for a hero and an icon in a sport we all love with a passion. Happy Birthday Manny - our esteemed friend and hero. 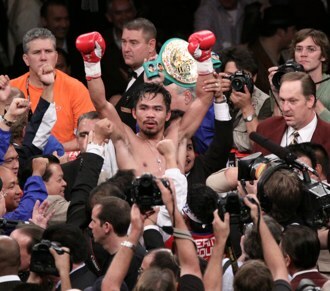 Top photo: Pacquiao celebrates after defeating De La Hoya on Dec. 6 in Las Vegas. Photo by Dr Ed de la Vega.